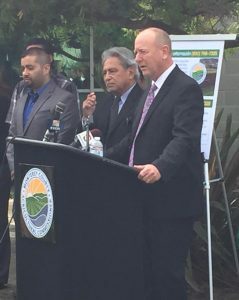 “California has the toughest farm pesticide restrictions in the nation, and Monterey County already imposes local rules that further protect farmworkers,” said Lauritzen at TODAY's press conference. “But we are going to do even more to communicate our commitment to safety in the fields." Intended to protect farmworkers, the initiate "has created a relationship between our office, the regulators and the farm worker community," said Lauritzen. "And it’s really building trust and confidence with our office and the regulatory program there to protect farmworkers,” noted Lauritzen.